The high school division didn't provide the superlative performance most were expecting, but there was plenty to marvel at among the teenaged. Jacque Taylor of Petaluma, 15, took the high school crown by finishing in 20th place with a "clock" time of 54 minutes, 32 seconds. The freshman at Casa Grande High was also sixth among women. Shaun Stephens-Whale of British Columbia, 17, who wowed Dipsea enthusiasts with a spectacular run in last year's race without ever seeing the course, battled an allergic reaction earlier this week and finished 25th in 54:44. Just ahead of him was Kentfield's Reed Bunnell, 15, who took 24th just two seconds ahead of Stephens-Whale. In the Dipsea's long history, only eight men ran both the fastest actual time and won the race the same year. The honor role reads: Oliver Millard (1913), Mason Hartwell (1917), William Westergaard (1924), Walter Deike (1952), Fernando Leon (1958), Carl Jensen (1966), Homer Latimer (1977) and Sal Vasquez (1985). On Sunday, two runners - Mark McManus and Shaun Stephens-Whale - have a chance to join the illustrious group. The two share more than speed. Both were blocked by officials in their first attempts to run the race. And McManus won the Dipsea's Open section in 2005, while Stephens-Whale won it last year. But they also differ widely. McManus is 33, married, and with a first child due in November. Stephens-Whale is just 17 and graduating high school. McManus lives near the Dipsea Trail in Mill Valley, Stephens-Whale more than 1,000 miles away in a small town so remote it is reachable only by ferry. McManus was a star runner at St. Ignatius High in San Francisco. At UC Davis, he set school records in the 5,000 meters (still standing) and 3,000 meters, on Davis' home 8-kilometer cross country course and in the indoor mile. He was Davis' male athlete of the year in 1996-97. His personal bests are 4 minutes, 2 seconds for the mile, 14:03 for 5K, and 30:07 for 10K. Two years ago, McManus gave in to a long-simmering passion for the Dipsea. "I was amazed at how grueling and unrelenting the course is and I was equally impressed by the intensity and devotion of its participants," McManus said. In 2005, as a first-time entrant, McManus wasn't admitted into the Dipsea's Invitational section. He responded by winning the more-crowded Open group in 51:49, the best time there in 20 years, and only 25 seconds slower than the fastest time in the Invitational. Last year, McManus ran 49:35, the best time recorded since 1998 (by unrelated Mike McManus). "The Dipsea is by far the hardest race I have ever run," he said. "You experience the absolute low in terms of physical and mental exhaustion and you have to will yourself through it. At the end, when all the hills are behind you and the dust has settled, the feeling of accomplishment and self satisfaction you get cannot be matched." Recovered from injury, and newly armed with his graduate degree in occupational therapy, McManus is focused on Sunday's race. He lives, with wife Quinn, in the house where he grew up. "To win such a historic and grueling race as a Mill Valley local would be something very special," McManus said. "When I'm sacrificing myself up Cardiac on a weekly basis, in the back of my mind I believe I just might have a chance." The call of the Dipsea also reached Stephens-Whale in tiny Roberts Creek on the British Columbia mainland. "I tried to enter in 2005, but I was too late," he said. "So I immediately made a reminder note on my calendar for March 16, 2006, entered online early that day, and got in." He arrived in Marin just before the race. Not knowing the course, and certainly not the shortcuts, Stephens-Whale simply followed the hordes ahead and won the Open section by a massive 135 seconds, in 53:55. Since first cracking 40 minutes in a 10K at age 12, Stephens-Whale has improved rapidly every year since. Roberts Creek is a mountain-biking hotbed, and his dad, Ian Whale, is a national-class cyclist. But Shaun, who bikes as well, found his niche as a mountain-running specialist, the steeper the climb the better. Indeed, he participated only nominally in his high school's track and cross country programs, instead running mostly solo, 50 miles a week on a logging road that climbs 2,500 feet up Mount Elphinstone. 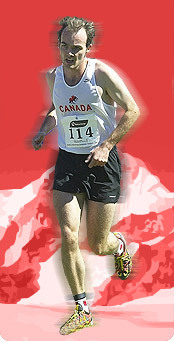 In 2006, Stephens-Whale was overall champion of the five-race 5 Peaks challenge, the most prestigious mountain racing series in Canada. He was the first junior ever to be selected for Canada's international open-mountain racing team, earning a trip to the World Mountain Trophy Championships in Bursa, Turkey. There, despite a stomach flu forcing him to slow down and walk several times, he finished 41st in an elite field of 80. He took 13th in New York's Empire State Building Runup. The advantages of running in Invitational, a year of Dipsea experience, and the faster times he's achieving in 2007 races vs. 2006, should enable Stephens-Whale to break 50 minutes, perhaps even 49. There are catches. He has asthma - he must take medication before each race - and grass pollen allergies have done in more than a few Dipsea racers before him. He's more of an uphiller than the downhill maniac the Dipsea favors. And he still doesn't know the course like his wily top competitors, who train on it regularly. However his showdown with McManus, the rest of the field, and the course turns out, Shaun will likely be carrying at least one big trophy back on the plane; High School, Best Time, perhaps even the winner's Bear.